Had I taken a picture, instead of this beautiful couple signing their marriage license, you might be looking at a selfie of a sad, newly married gal leaving the Georgia Department of Motor Vehicles without a new license because she didn't know the difference between a marriage license and a marriage certificate three years ago. Simply stated, a marriage license allows you to get married and a marriage certificate is proof that you are married. Had I known this difference shortly after Bryan and I were married, I would not have spent 4 hours in the trailer that is the Fulton County DMV in the middle of a sizzling southern summer. With the air-conditioning out of order. And with the wrong documentation in hand. I had a copy of our license (meaning we could get married) instead of a certificate (certified proof that we were in fact married). But no worries! Getting all the correct documentation you need for your big day (and the days to follow) can be easy and you can usually find all the info you need online. Laws to obtaining a marriage license can vary from state to state or county to county, so be sure to get the correct information for the place where you'll actually be getting married. You'll want to know any details that will be helpful or that are particular for where you're getting hitched. For example, currently if you're getting married in Georgia and you complete a qualifying premarital education program (a good idea anyway), your application fee will be waived. If you're saying your vows in Georgia, HERE is a good place to start looking for information on obtaining a marriage license. Where do you apply for your marriage license? What documents do you need to bring with you in order to get a marriage license? How long is your marriage license valid for? Is there a waiting period to obtain a marriage license? Is a blood test required to obtain a marriage license? What does it cost and how can you pay for your marriage license? If you're not planning to have a signing ceremony of any kind on your wedding day, it is a good idea to go ahead and provide your officiant with your marriage license beforehand so you don't have to worry about it on your wedding day. Whoever presides over your ceremony is responsible for signing and sending the license back to the place of issuance. 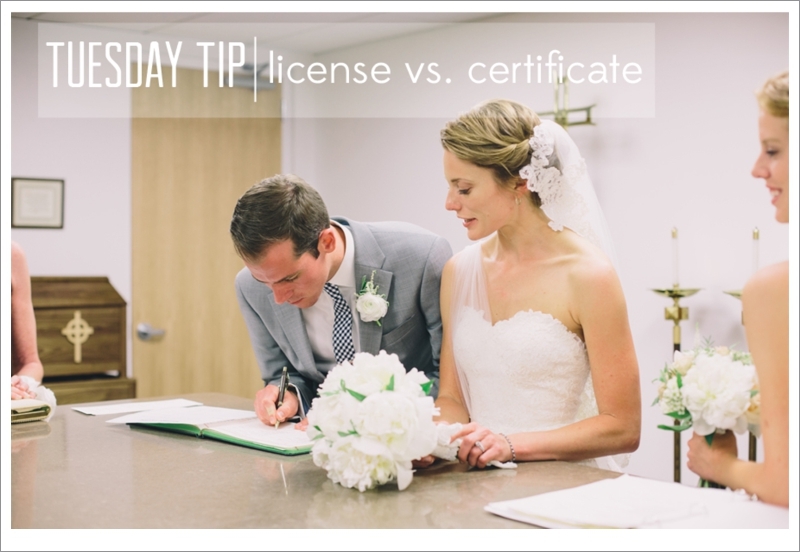 When applying for your license, go ahead and look into having a couple copies of your marriage certificate mailed to you after the wedding. After you receive your marriage certificate, you can start the name change process. This is a whole post by itself! Expect to see a very helpful Tuesday Tip in the near future covering the timeline, cost and details involved in changing your last name. But, first things first...get your license to wed!